Today I am sitting in a tiny house I helped build and writing. I now get paid to write. I always wanted to write but it seemed like an entirely impractical job. So, I got a practical one. And I waited. All those years I waited I was really good at making excuses why I couldn't do anything. I can start writing as soon as I have saved enough money. No one is interested in the things I'm writing. I can't quit my job now, I need insurance. When the mortgage is paid off I can start. My job is good, I would be an idiot to leave. The longer I made excuses the easier it was not to do the things I really wanted to do. I became comfortable and complacent. I followed the path of least resistance because it was easier. There is a lot of risk inherent in all of the things I've done over the last few years. Building a tiny home is risky. Quitting a well-paying job is risky. But I finally realized that the benefits outweighed the risks. I'm not saying I wasn't scared. I was terrified. I also knew that I was the only thing standing in my own way. When the days I came home in tears outnumbered the days I came home feeling pretty okay, I couldn't wait any more. It is easy to make excuses. It is easy to sit back and say you should wait until the right time or until you're ready. 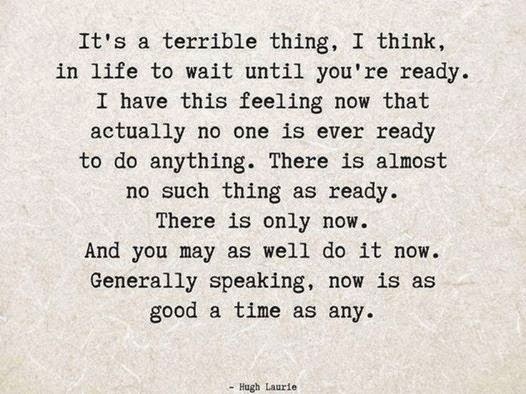 Maybe you would argue that I was ready when I finally took that leap. I would absolutely say that I'm still not entirely ready. But I also wasn't content to stay where I was any more. I decided against the devil I knew and headed directly into the arms of the one I didn't. I did it because I couldn't do the other thing one day more. Humans are really good at self-defeating behavior. There are always the reasons we can't do things but we hardly ever think about "what happens if I do it anyway?" All of the people we look at and see as successes and role models have one thing in common. They stopped making excuses. Instead they said "Why not?" What is holding you back from doing what you want to do? It's not the easiest thing to do, but so rewarding in so many ways. Making this film is the riskiest thing I've ever done, but so empowering at the same time. Thanks for writing such an inspiring post, it helps in the times of "what the heck am I doing!???!?" moments. Hi, the thing that's holding me back is that I need an income to survive (food and things). I'd love to write online or do shows (in fact I already have 2 websites and plans for a youtube channel) but they are free. I literally just don't know how people make an income that way. Is it freelance work where sites pay you to write articles? The only way I've heard of people making money doing these types of things is through advertising, and that's just not something I'm willing to do with my projects. Thanks for reading. I'll tell you - I felt that way once, too. I kept my job because I wasn't sure how to make money as a writer. I don't make any income from this blog. I do very little advertising because that just isn't part of my personality. For freelance work I marketed myself the old fashioned way to companies who create websites and provide content for a variety of industries. I sent a cover letter and a resume just like I would for any other job. Everyone's journey is going to be different and what worked for me may not work for you. I suggest researching topics like Location Independence to learn more ways to make this happen for yourself. I linked over to your post from Rowdy Kittens and really resonates for me right now. I am out of excuse and making some changes. Love this post! Of course I am the one holding myself back from doing what I really want and have spent a looong time getting to the point where I feel ready. Of course that point is never coming - I realise that now so I just have to jump off anyway. Thanks for the nudge! I'm still waiting to find out what I want to do with the rest of this life that was blessed upon me. Great post and I SO admire you for doing it. I am crying a few times a week, yet still I cannot make a BIG change. When you have played it safe and responsible your whole life, making a BIG mistake is terrifying! You might negate all the suffering you have made over the years and in one fell swoop. I've seen it happen firsthand to people. At least the rest of us can live vicariously through you. Great job! Just stumbled across this site @ 2am while searching tiny houses...of course im about 80 levels deep into my online searching from where I started at....most recently looking at solar kits, onto bathrooms, thus a link to here. Thanx for helping blaze the trail...all the best. You will inspire others by stepping out into the unknown, that's having real faith to believe in your dreams and then go for them. I can testify to the fact that following your heart can actually save your life from the stress (and all it encompasses) when you force yourself to remain in a career which is killing you every day you go to work. My nursing cap is off to you! Keep #moving forward! We downsized once before, when I went back to college. We loved everything about it. Then we got a big house again...which was a mistake. We're in the process of building a gym business and now we're moving our family of 6 into a travel trailer. It may or may not be the "right" thing to do, but it'll be an experience and I'm ALL ABOUT making memories instead of stuff! Thank you so very much for your kind words. As a blogger I sometimes wonder if my message is hitting home for anyone. Because of your feedback as well as the others on this thread I am very happy that it touched you in some way. Thanks for reading!